High quality, yet inexpensive promotional Day Trip Kit in bulk, custom imprinted. We also supply blank (not personalized) bulk Day Trip Kit for $7.37 each. Free artwork design and Free proofs! American clients pay no taxes. The unit prices below include your 1-color custom imprint on all 3 items. Add the amount shown for each additional imprint color. We also supply blank (not custom imprinted) bulk Day Trip Kit for (EQP) each. Setup Charge: $75.00 per first imprint color; $30.00 on re-orders; $50.00 per additional imprint color. Production Time: 7 days; Rush Production of 4 days: add $1.25 per kit. Blank (not custom imprinted) kits ship next day. 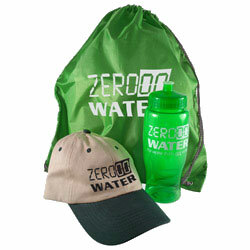 Our fun kit includes imprinted Drawstring Backpack, Transparent Sports Bottle and Cotton Hat. Hat and bottle are packed inside the drawstring backpack. Lightweight Cotton Hat, Adjustable Fabric Strip with Brass Buckle. Low Crown-Unconstructed. Pre-curved Visor. Imprint Area: 2 1/4" x 4 3/4"
Color: Black, Blue, Khaki, Khaki & Black, Khaki & Green, Khaki & Navy, Navy Blue, Orange, Red. Imprint Area: 2 1/2" x 3 1/2"
PRODUCTION TIME: 7 days after art approval; Rush 4 day production is available: add $1.25 per kit. Blank kits ship next day.